A progressive engagement clutch disc having a compressible clutch plate assembly mounted between the clutch flywheel and pressure plate. The clutch plate assembly has a pair of outer aluminum, heat dissipating plates, a center wave spring plate coaxially mounted on a hub for axial movement relative to one another and the hub, and clutch facings on the outer sides of the outer plates engagable with the clutch facings on the flywheel and pressure plate. 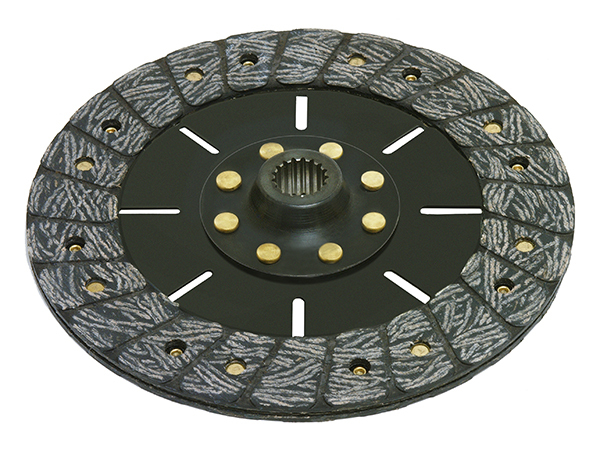 During clutch engagement, the clutch plate assembly and its spring are progressively compressed between the flywheel and pressure plate until the clutch plates are firmly fripped between the flywheel and pressure plate to permit torque transmission couplet to the clutch, and other problems associated with conventional clutches. Available for twin disc systems as well. US Patent 5,226,516.